In this call, Keisha and Alun talk about Being. What if other possibilities exist for Choosing, Receiving, And Being? If you could choose and receive anything, who would you be? What if you don’t have to keep making yourself wrong for being you and for desiring to choose and receive something different from others around you? What if Choice and Receiving are superpowers that will change anything in your life? What if Being you, and choosing to choose and receive with ease is the gift you came here to be? 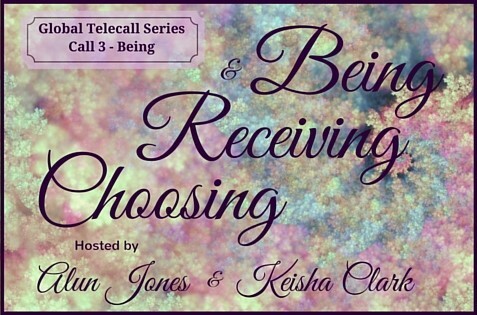 Keisha Clark and Alun Jones invite you to join them on this 3-part tele-series where they will get curious about choosing, receiving, and Being. They’ll be sharing insights, awareness, and some dynamic tools for creating the change in your life that you’ve been seeking. They will facilitate, coach, and empower you to be more present with your choices and your willingness to receive. You may purchase the individual call recordings for £26 ($40) each or the whole series for £65 ($100). What would be the greatest contribution to you and your life? Are you ready to be choosing and receiving in ways that work for you rather than against you? Are you ready to allow yourself to receive everything you are without making yourself wrong for it? Are you ready to Be you, choose for you, and receive what you truly desire without apology? Dare you be that different?